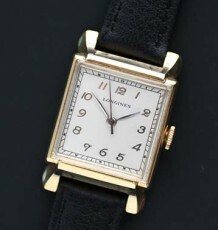 A Hamilton vintage watch that appears to date to the 1940’s. The case is gold filled with fancy scrolled lugs. Hamilton Watch Company was perhaps one of the most dominant American Watch Companies through the second half of the 1800’s and the first half of the 1900’s. 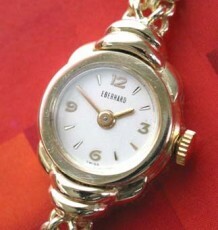 Today the company is part of the giant Swiss conglomerate SMH, also known as the Swatch Group. 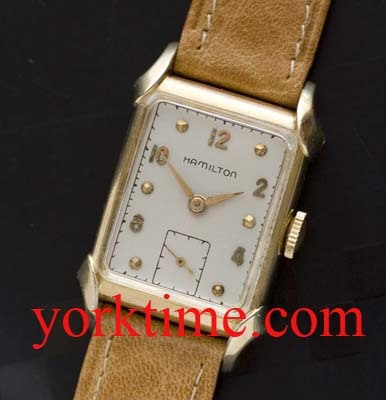 Back in the 1940’s Hamilton was producing beauties like this stylish Hamilton Milton with its rectangular gold filled case and fancy scrolled lugs. The dial of the watch is in excellent condition and is easy to read with the alternating even Arabic numerals and gold toned dots. 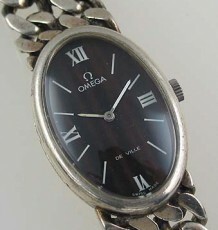 The watch is fitted with a high grade 17 jewel Hamilton 980 movement, which was just serviced and is keeping excellent time. 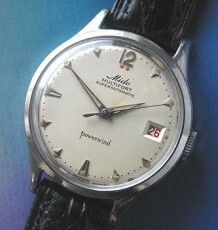 The watch measures 24 mm wide by 36 mm long and is pictured on a tan leather strap but the buyer can elect to have it supplied on a brown or black leather strap instead.